to view the full brochure. Sonicu provides superior operational visibility and uniform implementation across all departments, locations and applications with one cost-effective solution. From Good Manufacturing Practices through warehousing, distribution and retail, Sonicu wireless monitoring technology provides easily-implemented, cost-effective solutions for unsurpassed safety and effortless regulatory compliance. 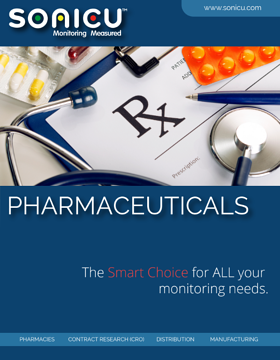 Download our free Pharmaceuticals brochure to discover how one wireless, cloud-based monitoring platform improves safety, streamlines regulatory compliance and saves time and money for your enterprise.